Creating beautiful corner cabinetry that makes the most of the space is vital in kitchen design. Designing kitchens can get very intricate and trying to utilize all the square footage without having any dead space is difficult. Most kitchens have an L-shaped layout which mean at least one corner., with two corners for a U-shaped design. What can you do to make the most of this space? That is where the Wellborn Corner Storage Solution comes into play. 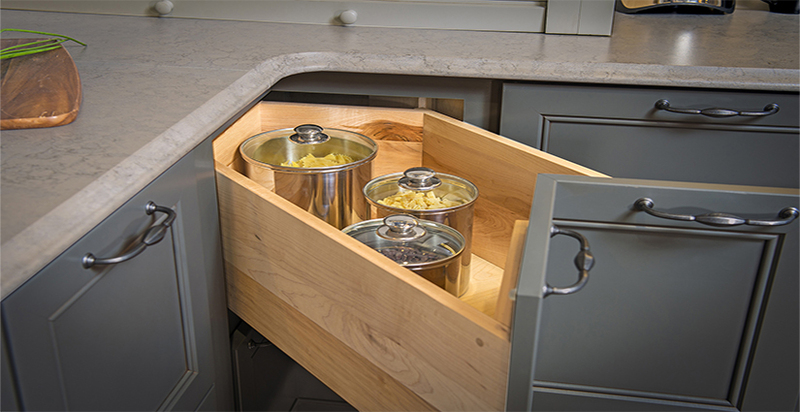 Instead of a lazy-susan or a blind corner cabinet, this revolutionary corner cabinet allows for deep or shallow pull-out drawers for storage that you can actually access. Wellborn's Corner Cabinet Drawers have a unique design to best utilize the dead space of a corner cabinet. 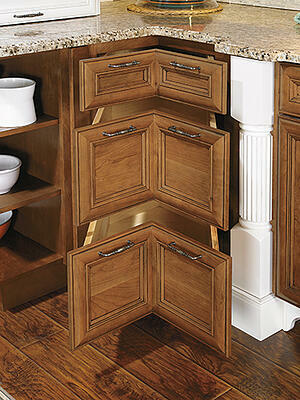 With normal shelves or a Lazy Susan, you need to bend down or kneel in order to access the contents of the cabinet. Save your knees! These angled drawers make that requirement a thing of the past. With many options in drawer size, color and style, this will be a welcome addition to your next kitchen remodel! Here are some more corner cabinet alternatives.